*Established in 2004 ....... Celebrating more than a decade of helping people overcome the #1 Fire Cause -- Cooking ! 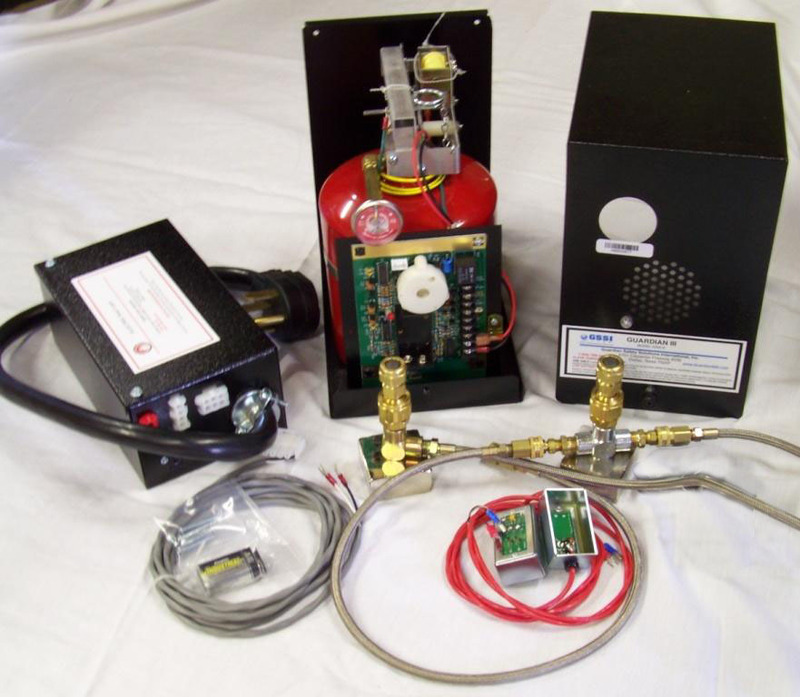 THE GUARDIAN SYSTEM: Automatic Fire Suppression for your Residential Cooking Equipment ! G300B, with electric or gas automatic shut-off, has been tried and true for more than 20 years. This system can be used from 18 in. to 31 in. above the cooktop surface. G500B, with electric or gas automatic shut-off, is similar but has been updated, upgraded and has a few extra features for improved self-monitoring and functionality. This system can be used from 18 in. to 31 in. above the cooktop surface. 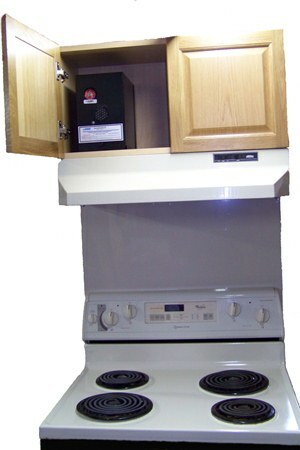 Electric ranges not to exceed 42” wide x 24” deep, or 1008 sq. in. Gas Ranges not to exceed 36" wide x 24" deep, or 864 sq. in. 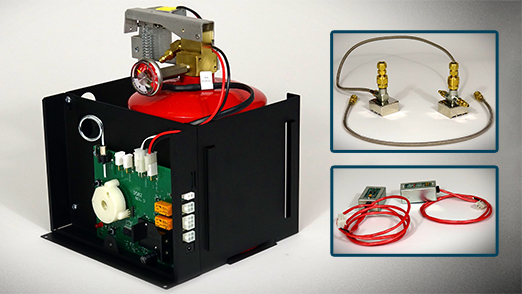 The basic G300B & G500B systems are complete, ready-to-use automatic fire suppression systems, with automatic electric or gas shut-off, battery operation, and everything you need for immediate installation and operation. An Owner's Manual is included with every system; this has specifications, operations, maintenance, and installation parameters for the do-it-yourselfer or the contractor. The system is designed to be modular, plug-and-play, and easy to install without special tools or skills. The Guardian III system has a small built-in local alarm, and it is self-monitoring for continuity and battery strength (long-lasting battery).They are pre-engineered, prefabricated, and very well built. User-side assembly is all that is required. The Guardian III system is not compatible with commercial cooking equipment. *The Enclosure/Tank Assembly is installed in the cabinet above the vent-hood, and the Automatic Shut-off is installed below or behind the stove or range-top. *See the systems, determine your needs, send me some information on your job, along with your contact information, and I'll put it all together in a proposal or an invoice and return it to you. Following is your special iFLSS Do-It-Yourself (DYI) pricing. Complete Guardian III (G300B) system, with electric shut-off and interconnecting cable; battery operated; with Owner's Manual for installation and maintenance instructions. Maximum of 1,008 square inches of coverage (42" x 24"). 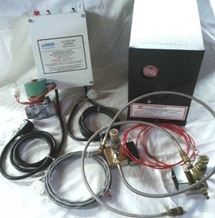 Complete Guardian III (G300B) system, with 3/4" gas supply (110v) shut-off; battery operated system; with Owner's Manual for installation instructions. Maximum of 864 square inches (36" x 24"). Include a remote activation switch, aka. "Pull Station". Comes with 30' of cable and proper signage. 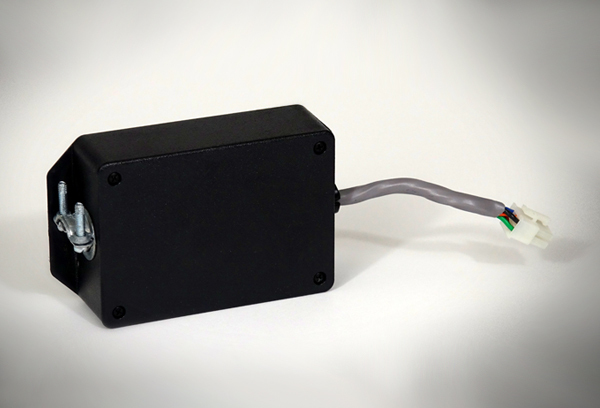 Include an interface enclosure assembly, aka. "alarm system interconnection". Complete Guardian G500B system (updated, upgraded G300B system), with electric or gas shut-off and interconnecting cable; battery operated; with Owner's Manual for installation and maintenance instructions. Automatic shut-off is included (not shown). Maximum of 864 square inches (36" x 24") for gas. 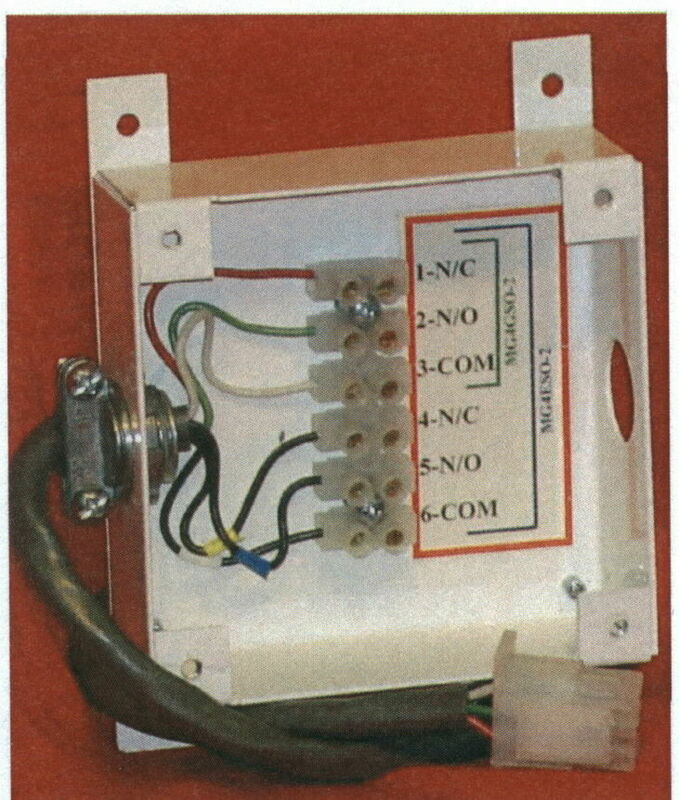 Include an Alarm Interface Assembly, for connection to your alarm system. Include a remote activation switch, aka. "Pull Station". Comes with 30' of cable and proper signage. Wet Chemical portable fire extinguisher; Class K; 6 liter capacity; Cylinder Material is Stainless Steel; Operating Pressure is 100 psi; Discharge Time is 53 seconds; Effective Range is 12 feet; Height is 19 in x 7 in. round; Wall Hanger bracket; 23 pounds. Rechargable; Refills are available. Ships ready to use. *This is not part of the basic system, but provides a "second shot" if necessary. 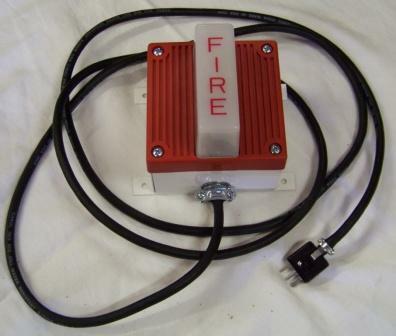 This PFE can also be a manual, "stand-alone" system, and can be used on fires involving ordinary combustible materials (1A; K rating). iFLSS-DIY price: $225.00 (Retail up to $300.00) You save $75.00 ! Shipping to the lower 48 states (US) is by FedEx Ground service. 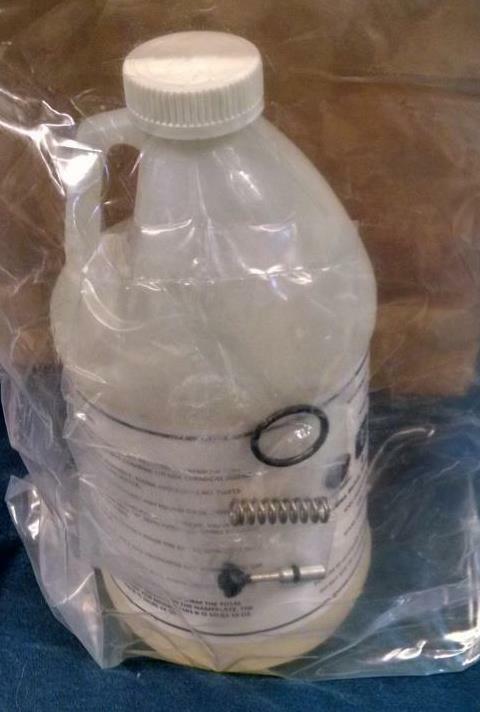 This is considered a hazardous shipping item [similar to a portable fire extinguisher], and is somewhat heavy at just under 40 pounds. We can drop-ship to your business or to the job-site, saving you time and money. Someone will need to sign for it, on delivery. The average cost is $78 for a single system, and $98 for two systems. Larger orders can save on shipping using truck freight. Overnight shipping are via FedEx Air Express, beginning at $280 for single system; add $85 more for each additional system. *Please call or email for air express shipping, or if you're outside of the contiguous 48 states (US). Orders will be assembled especially for you as ordered--when ordered, and usually ship-out within 24 hours. Normal delivery is 1 to 7 days in the "lower 48", depending on your specific location. *Sorry, but we can no longer afford to extend credit or carry "open" accounts. However, we can and will save you hundreds of dollars ! 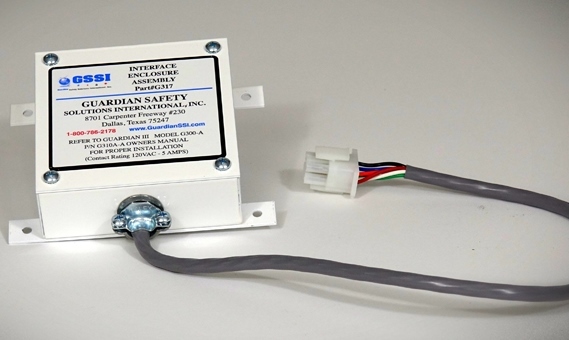 Manufacturer's Limited Warranty: Guardian Safety Solutions International, Inc. (GSSI, Inc) warrants to the original consumer its Guardian Range-Top Automatic Fire Protection System (GUARDIAN System) shall be free of defects in materials or workmanship for one (1) year from the date of purchase, under normal residential use. Items/Parts altered or damaged during installation or use or by improper return shipping may not be covered. Returns Policy: Under no circumstances can goods be returned without prior authorization. Returns, other than for defects, are subject to a 25% restocking fee. No returns will be authorized more than 90 days after delivery date. You must follow packaging and shipping directions carefully for returns. Damage on installation or during the return will not be covered. *Simply use the form or Contact Information below to email your inquiry, question, or request, and receive a prompt reply. We want to get your customized system right and shipped to you quickly -- the first time. Just what you need, and nothing that you don't need. and make your home, dorm, business, church, base, or fire station much safer ! There are a few variables that will determine the cost of your Guardian III system (G300-B). 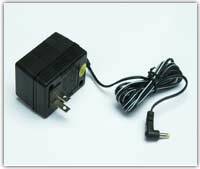 1) Determine your heat source and connection (electric or gas; 4-prong, 3-prong, or directly-wired electrical connection). 4) Compatibility of the vent hood is very important. The less expensive, steel, simple type of hood, with fan/light in the center and 3- to 4-inch depth, is best. 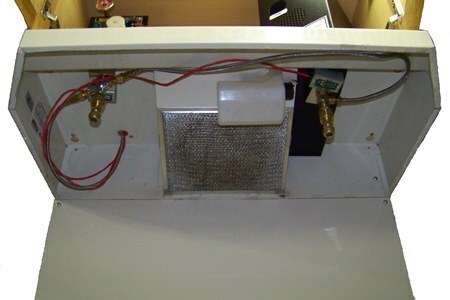 Hoods can be ducted or recirculating type (non-ducted). The G300B and G500B systems require open space underneath the hood for magnetic mounting of the distribution nozzles and temperature sensors. The Guardian Model G600B was designed for other range-hoods with limited space underneath, such as microwave/vent-hood units and designer hoods with filters covering the opening underneath. The Guardian Model G600B-C is similar, and was designed for higher vibration applications, such as food trucks, boats, trains, car haulers, and recreational vehicles. Most island arrangements are not generally compatible, but may be engineered to accommodate the system. The Guardian systems are not compatible with commercial vent hoods. For solid stainless steel hoods, you will need to fabricate steel mounting plates (foot-plates); small electrical outlet blank covers work well for this and are inexpensive. Many "stainless steel" hoods will still hold a magnet. Please consult the Owner's Manual for proper system installation instructions. *If you tell me the manufacturer and model number of your vent-hood, I will assess compatibility for you. 8) You can print the invoice and pay with a check, receive a customized credit card payment form, or pay with PayPal and/or your credit card. (You don't have to be a member of PayPal). Other arrangements can be made, by request. Research other web sites or systems, then come on back to get your "Lowest Total Price" Guarantee. Also, if you need multiple systems, you can receive an even bigger discount. The Guardian Systems can be installed easily with no special tools or training-- all the information you need is in the Owner's Manual. We also have a full line of service, repair, and replacement parts for all Guardian Systems. 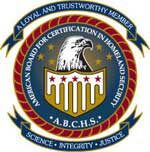 We are proud members of the National Fire Protection Association (NFPA), and we participate in and support the Certified Fire Protection Specialist program.